The cryptocurrency’s meteoric rise has stunned the world and defied traditional laws of market behavior. After years of being labelled as an “experiment,” “bubble,” and “fade,” the cryptocurrency market continues to remain overall resilient in the face of incredible uncertainty. The crypto movement has gained such a vast amount of steam in such a short period of time that a visual is needed in order to truly appreciate the dramatic changes. 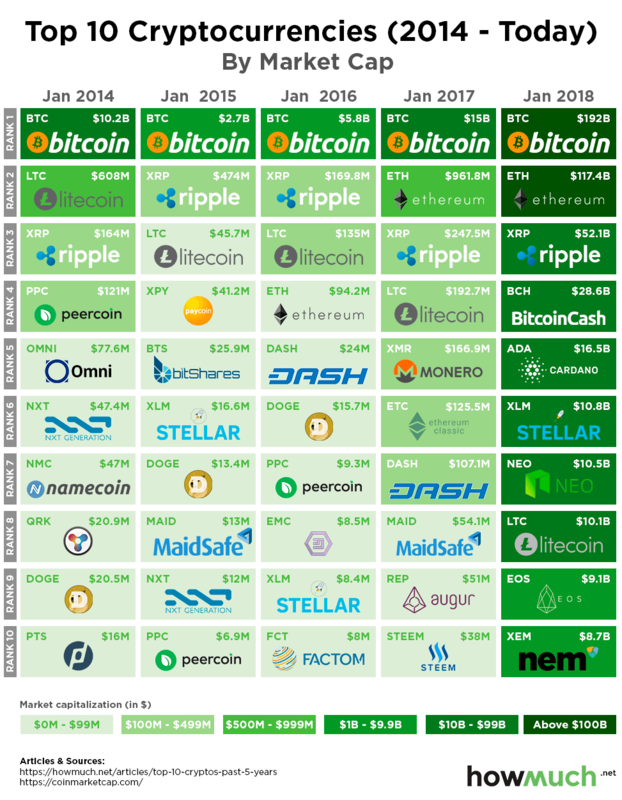 In order to showcase the growth in the overall cryptocurrency, we chose to create a visual showing how the top ten cryptocurrencies by market cap have changed over the past five years. Using January as the benchmark, we found the top ten cryptocurrencies by market cap between the years of 2014 and 2018 from CoinMarketCap.com. In order to more clearly depict the market cap growth during the time period, we used a green color scale ranging from light to dark shade. The darker the green background on each square, the larger the market capitalization. Conversely, lighter shades represent smaller market caps. The “grandfather of cryptocurrency,” Bitcoin, has single-handed brought the crypto market to where it is today. Without Bitcoin, there would be no cryptocurrency market. However, the “grandfather” is getting old as other altcoins continue to see massive growth and influence within the emerging industry. In January 2014, Bitcoin’s market cap was $10.20 billion, which represented 89% of the total market cap of all cryptocurrencies. As of January 2018, Bitcoin’s market cap has skyrocketed to $192 billion, but now only represents 33.40% of the overall cryptocurrency industry’s market cap. As cryptocurrencies were continuing to ride out the final stages of its first bull market in January 2014, only four coins were valued above $100 million dollars. By 2015, the market saw a steep crash, which resulted in only two cryptos above the $100 million mark in the top ten. The market reloaded in 2016 before leading to the start of the current bull run. In January 2017, the crypto market saw a record seven coins above the $100 million mark, but only Bitcoin was still in the billions club. After cryptos began going mainstream in late 2017, a face-melting rally began which propelled all top ten of the largest cryptocurrencies into the billion-dollar market cap club. Overall, the total market cap of the top ten cryptocurrencies has risen from $11.36 billion to $455.57 billion between January 2014 and January 2018. This translates to an increase of $444.22 billion or 190.27% over the five-year period. Interestingly enough, the top three largest cryptocurrencies in January 2014 would be the only three to consistently make the top ten list each year: Bitcoin, Litecoin and Ripple. Ethereum busted onto the top ten scene by January 2016, and has surprised the entire community with its massive rise to be undisputed second largest cryptocurrency by market cap for the second year running. Overall, each year brings new revelations and insight into the state of the cryptocurrency market.